In the early 1960s, as part of their e ort to survey the lunar surface for appropriate landing sites, NASA sent unmanned lunar orbiters to survey the moon. The orbiters documented the moonscape with quick successions of photographs that—like Polaroids—would be developed onboard, scanned, then sent to earth. The analogue transmission could take as long as an entire day for a single photo to reach earth. Brambilla worked with NASA to digitize these de-archived photos as part of NASA’s Lunar Orbiter Image Recovery Project (LOIRP). Reassembling hundreds of analogue images to create a seamless series of longitudinal panoramas, they were in turn animated to faithfully simulate the trajectory of the original orbiters as a virtual flyover. The temporal plane of the spectator, in e ect, is transported back to the sixties using technology which did not yet exist at that time. Orbiter 1 displays a virtual trajectory of the first Orbiter mission to the Moon which is also included in the compendium of trajectories that compose the Lunar Atlas. The site-specific installation at Borusan Contemporary reinforces the notion of forming a reconstructed cubist moonscape on multiple planes. The cartography-inspired grid structure is mapped across all projection surfaces. A randomization of the Orbiter trajectory generates startling juxtapositions of images that yield an arresting geometry. 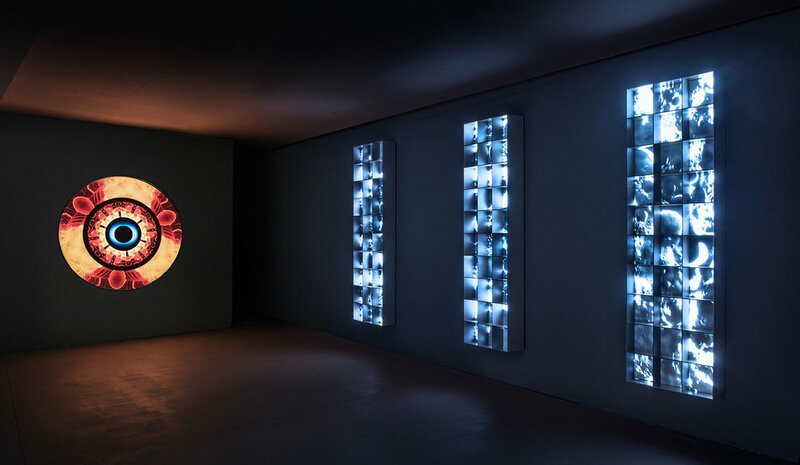 When projected as a grid on the horizontal surfaces beneath the balconies, this presents the spectator with an impossibly detailed view scanning the surface of the moon. The presentation of the moving images reinforces the impression of watching a series of transmissions traveling across 60-year time rift. These changing sequences introduce a mysterious sense of the underlying discordances between electronic space and physical space. The e ect is as though we were receiving moving flyover images in real time, with each section of a large-scale canvas formatted into a grid. In Lunar Atlas, the analogue and the digital seem to coexist, one as content, the other as the means of reproduction. What is lost in transmission is itself a medium of their reconfiguration for aesthetic aims. They remind us that the meaning of a work of art can derive as much from its process as from its final material realization, and that no technology mitigates the moon’s capacity to mirror our aspirations of transcendence.